"A short but very funny Mario Parody!" Super Plumber Man vs The Elf King is an incredibly short yet very funny game, well there is one very funny part to it which you will find when you confront The Elf King, the whole game can be completed in less than two minutes and was created in less than 48 hours for one of the Ludum Dare game jams and is a rather obvious parody of the Super Mario Games but it’s a very enjoyable two minutes as you blast your way through these tiny elves, squishing them with your massive plumber feet! 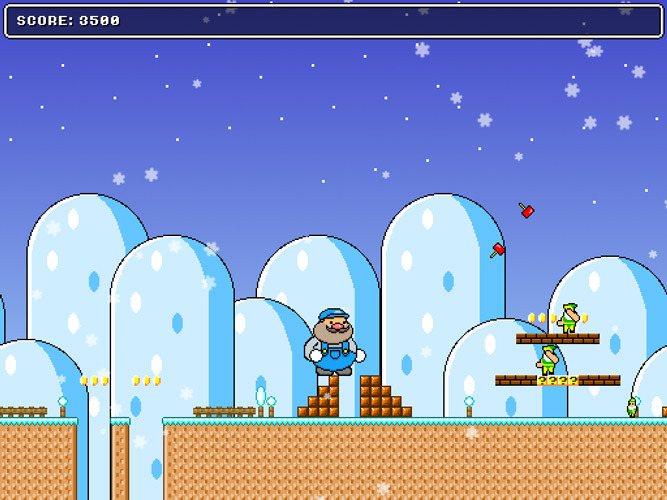 Colorful and enjoyable but sadly all over far too quickly which also means it’s difficult to write to much about it but if you want a quick and silly game of something Mario-esque perhaps during a short break from work or school then you can download Super Plumber Man vs The Elf King here for free.